Rasmea Odeh’s International Women’s Day speech | Fight Back! It is really powerful to speak with all of you as we celebrate International Women’s Day, originally called International Working Women’s Day, a day historically linked to the year 1908, when 15,000 factory working women organized a march that filled New York City’s streets demanding equality and other social rights such as shorter work hours, better pay, voting rights, and an end to child labor. A few years later, over 140 women died in a NY factory fire caused by horrible working conditions. These events became symbols of the importance of women in the working class and national liberation movements for equal rights and independence, and the Second International Conference of Socialist Women in 1910 officially established March 8th as International Woman’s Day. Since then the world has witnessed a significant shift in both women's and society's thoughts about women's equality and liberation. Women are standing strongly for their rights in spite of the complex system of patriarchy that attempts to keep us down. As long as we believe in ourselves and have confidence in the justice of our struggles, we will accomplish our hopes and dreams. First and foremost, this includes working hard to win women’s rights and to eliminate the disease of racism and national oppression against Palestinians, Arabs, Muslims, Black people, Latinos, Asians, and other people of color in this country. We can accomplish this by strongly standing together and dedicating our lives to these ideals, the same way women have dedicated their lives to the liberation of my homeland of Palestine. Here we are! I have faced adversity, repression, and injustice since my arrest in October 2013. But I continued to stand up to these crimes against me, and I know that we will achieve justice in my case, because of the great legal work of my brilliant lead attorney Michael Deutsch and his team, because of the steadfast organizing of my defense committee, and because of the encouragement of my family and friends and all you supporters. You give me important strength and resilience. It’s not a secret to say that your support shifted the negative discourse in the case, and helped lead to our most recent victory in the decision of the Sixth Circuit U.S. Court of Appeals! 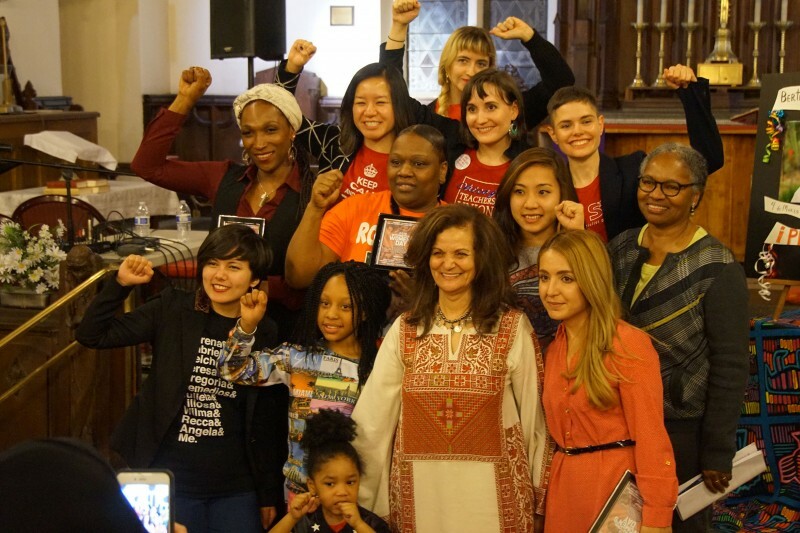 The story of our struggle for women’s rights, equality, and liberation belongs to no single person or any one organization, but to the collective efforts of all who care about justice. We continue to find inspiration and strength from women across the U.S. and the world, and that inspiration and strength will help us achieve all our goals. Lastly, we often leave our appreciation and gratitude unspoken. But today, on this exceptional occasion, I want to take the opportunity to say thank you. I send my special warm greetings to every one of you, especially the women on this, YOUR DAY. Be proud of yourselves and don’t be ashamed if you sometimes get emotional. A strong woman is caring and tough, practical and spiritual, revolutionary and flexible. You are all of these, you are all powerful, and you hold up half the sky! Have a wonderful International Women’s Day! I wish you all the best.